Obviously a FWD model doesn't have a rear diff so this does not apply. I was starting to have issues with shifting out of park and there being a small jolt in the drive train. Aggressive speed changes or shifting and you could feel similar jolts. It is definitely a easy driveway job especially if you have a pair of ramps but can be done with a jack too. I think it took me around 90 minutes with a 3 year old that wanted my attention. I could have done it faster otherwise. Lift the rear of the vehicle up in the air for more clearance while you work underneath. I started with the drivers side (LHD) undid the 4 bolts (1 took a wrench not quite enough room for my ratchet) and remove the mount. I do suggest using a power wrench remove the 4th bolt that actually has the bushing doing that one by hand while laying on your back it a bit of a chore . Put the new one in place and tighten is all up following the torque specs. Now the passenger side (LHD) I found it easier to take the rear of the exhaust off the hangers and mounts, this involves two bolts and a rubber hanger all near the muffler. I then took a block off wood to keep it proped up and not just hanging putting stress on the front of the exhaust. This gave me some slack in the exhaust piping to more easily access the bolts on the passenger side. Again a ratchet is more than enough to get the 3 horizontal bolts but that vertical one though the bushing power tools make much easier. Replace, torque and reconnect the exhaust hangers. Unfortunately these bushing mounts should be rebuild-able but no one seems to do it so the old ones are garbage unless you have a metal scrapper that might pay a couple dollars for the old ones. Last edited by chain rattle; 12-08-2016 at 03:01 AM. followed your instructions on an Australian RH drive Outlander and got the mounts out. The rubber bushes were completely disintegrated (the central steel sleeve just fell out). I have ordered some new ones and hopefully can get a local mechanic to swap the bushes over with a press. The only thing I did slightly different to you is I had to undo another rubber exhaust hanger supporting the muffler at the inlet side and also the rubber hanger halfway down the vehicle near the driver's door - that way I could move the exhaust enough to access the vertical bolt through the bushing. I'll let you know how reassembly goes once I get the bushes replaced; I am hoping for a total cost of about $50 Oz compared to the Mitsubishi dealer quote of $600. We'll see. Back again and the diff mount bushes are done and the clunking sound when accelerating is gone! I bought replacement bushes (two for about $25) from an Australian supplier in Melbourne and had them the next day. Then I set about finding a mechanic who would replace the old bushes for the new ones - this wasn't a popular job, despite being told it would only take half an hour; no one wanted to do it, or I would have to wait a week until they had "spare time." 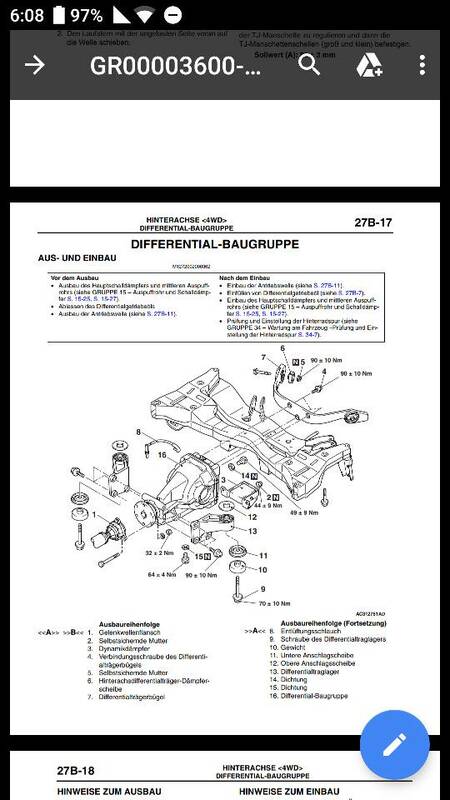 I even printed out the Mitsubishi manual page detailing how to install the mounts with the rubber lugs parallel the drive direction and marked up the mounts with white paint pen to make it easier. Eventually, I had to book them in and wait three days - for a cost of $95. When I finally attempted to reinstall the diff mounts, I found that the drive train had retracted upwards (the wheels had been off the ground as the car was on supports). I had to use the car jack to push the drive train down far enough to get the diff mounts back on. Torqued the bolts to spec, rehung the exhaust and back on the road. Job done. As I had originally mentioned no one wanted to or could even track down bushing to rebuild them at least for who I talked to. Do you have part numbers you can share of the individual bushings you were able to track down. Are the bushings on the rear differential support arm assembly (MN1000011) replaceable? Or is it necessary to replace the whole thing for a rather large sum of money? Does anyone have part numbers for those if they are replaceable? I recall digging around in the repair manual to finally get the torque specs. Or I called the dealership. I wish I had included them in the original post as I no longer have my notes from the repair. I just bought a 2003 outlander and I need to replace the mounts too. i just tested its towing capability its is simply great one of my uncle was using this as 24 hour towing truck service for a long time.